You cannot deny the resurgence in interest in vintage chronographs when looking at recent auctions, particularly with Patek Philippe and Vacheron Constantin. 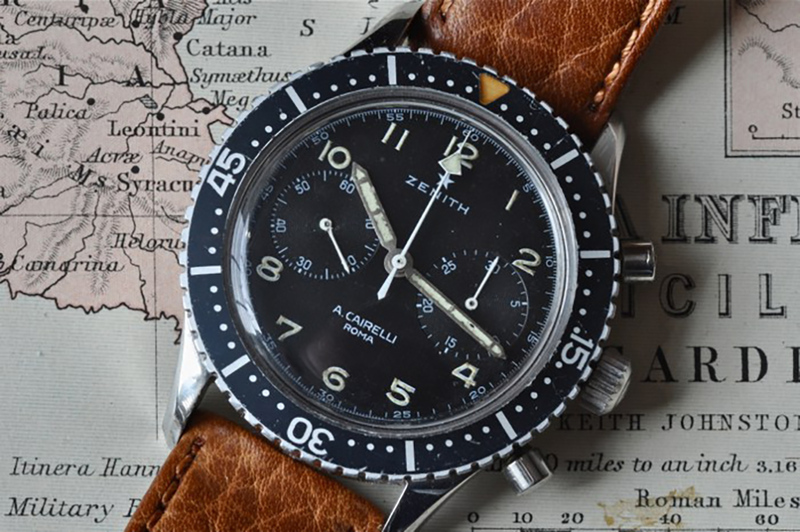 However, throughout the last couple of years when looking into military issued chronographs, the Zenith A.Cairelli CP-2, or simply the ‘Cairelli’, has kept on cropping up as one of the more interesting historically, whilst also striking the nail on the head aesthetically in every way. 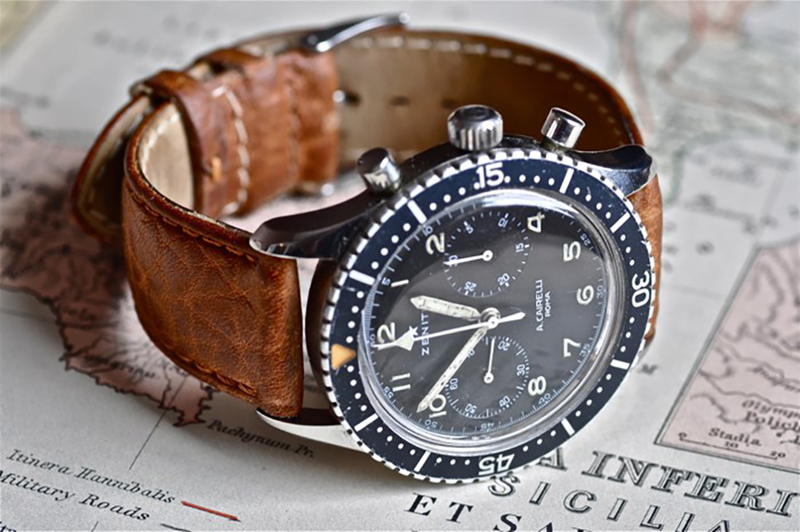 The story behind this particular Zenith chronograph lends to how it has become one of the most hotly contested vintage chronograph pieces on the market. From having been estimated at a sale price of around CHF 6,000 to CHF 7,000 last year, it is astonishing that this year during Geneva Auction week at the “Start, Stop, Reset” auction by Phillips it went under the hammer at more than CHF 62,500, well over the initial estimate of CHF 20,000. Developed by Zenith in the 1970s when a number of Swiss brands created chronographs for the Italian army, the CP-2 was designed for AMI ‘Aeronautica Militare Italiana’ pilots and supplied through A.Cairelli – the Roman retailer of watches and clocks. The A.Cairelli CP-2 bore the simple 3 letter inscriptions on the caseback of ‘AMI’, with a few pieces issued for the ‘Marina Militare’, ‘Publica Sicurezza’ and ‘Esercito Italiano’ each possessing either ‘MM’, ‘PS’ or ‘EI’ inscriptions. However, it is believed that of the 2,500 produced, only a handful lived a military existence bearing these inscriptions. The speculated reason behind this is that the AMI abruptly cancelled their order of the CP-2, therefore instead of being delivered to the military, Cairelli sold the remaining stock with the simple inscription of ‘Cairelli Tipo CP2’ inscribed on the caseback. 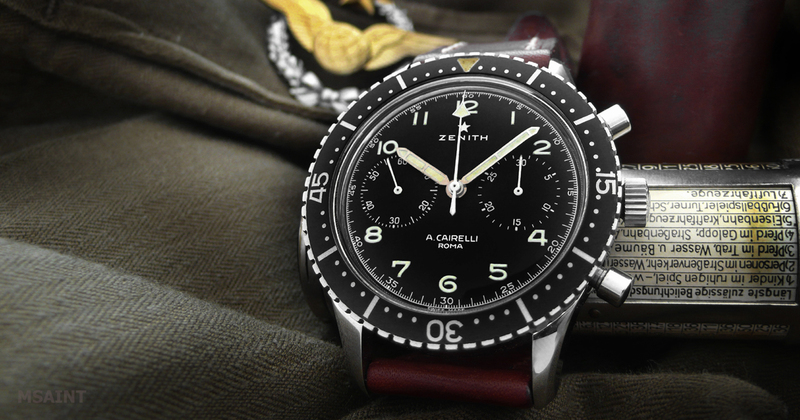 It is not only the rarity of the military issued pieces that have seen interest in the Cairelli grow in recent years but also the fact that it is one of the most beautifully crafted Zenith chronographs in existence, housing the 146 DP movement originally created by Martel Watch Co which was taken over by Zenith in 1959. The beautifully crafted 43mm 2-register chronograph, with its stunning black dial has us wondering, could it be due for a comeback? Featured photos courtesy of Watchuseek member, MMMD.